Former BOF chair Karl Johnstone has been appointed by Governor Dunleavy to fill a Board of Fisheries seat and his confirmation hearing will likely be as soon as next week. Last week, UFA voted to oppose his confirmation. It is going to take full action from our fleet to help get the word out that Mr. Johnstone is not the right fit for the board. We need you to act by contacting legislators and telling them you oppose Johnstone and why. There are three ways to do this! You may submit comments easily on the Alaska State Public Opinion Message. This online message form is for residents of Alaska only. If members are not a resident of Alaska, they will need to email legislators directly. Contact UFA for a full email list of legislators at ufa@ufa-fish.org. From other areas of Alaska, call toll-free 844-586-9085…and ask for the specific hearing. If you use social media, please create posts encouraging people to testify and write letters of opposition. Prepared by UFA staff and made possible by the support of UFA Group, Business, Individual and Crew members. 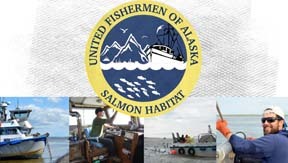 To join UFA see http://www.ufafish.org/become-a-member/. April 1-9, 2019 NPFMC Anchorage, AK – Hilton Hotel. June 3-11, 2019 NPFMC Sitka, AK – Centennial Hall. ?? June 7-8, 2019 Bristol Bay Fish Expo Naknek, AK. September 30-October 8, 2019 NPFMC Homer, AK – TBD.